Information– Paua and Abalone are marine gastropod mollusks (snails) that belong to the genus, Haliotis, known as ormer shells. The Paua, is a common species, which grows up to 18cm wide. These giant sea snails have a large muscular foot which helps them to cling to rocks. They live in tidal areas and feed on seaweed. Mother of Pearl is the colorful covering nacre that is created within the inner lining of many types of mollusk shells, the lustrous & iridescent material is produced in the same manner as pearls are created. History– Paua is derived from the Maori word for the sea snail. The genus “Haliotis” means ‘sea ear’. The industry was started in New Zealand in the 1980’s on small scale farms which produced meat, shells, and in some cases blue pearls. Most of the products were exported to the US and Asia. Historically, Mother of Pearl has been found in tombs of Sumerian Royalty and was often used not only for jewelry but for inlaid furniture, art ,and even in musical instruments. Folklore- Mother of pearl is said to have a calming effect and and allows for better memory recall. Some feel that this stone is helpful in healing wounds and improving vision. Care- Wearing often is an excellent way of keeping the shells lustrous. The natural oils of your skin actually help and protect the shells from drying out. Use of a jewelry cloth for mild wear or lukewarm water and a soft toothbrush for exceptionally dirty shell jewelry. Avoid exposing Mother of Pearl to acidic or alkaline subjects. Store out of direct sunlight in a separate compartments, storage containers, or jewelry bags. 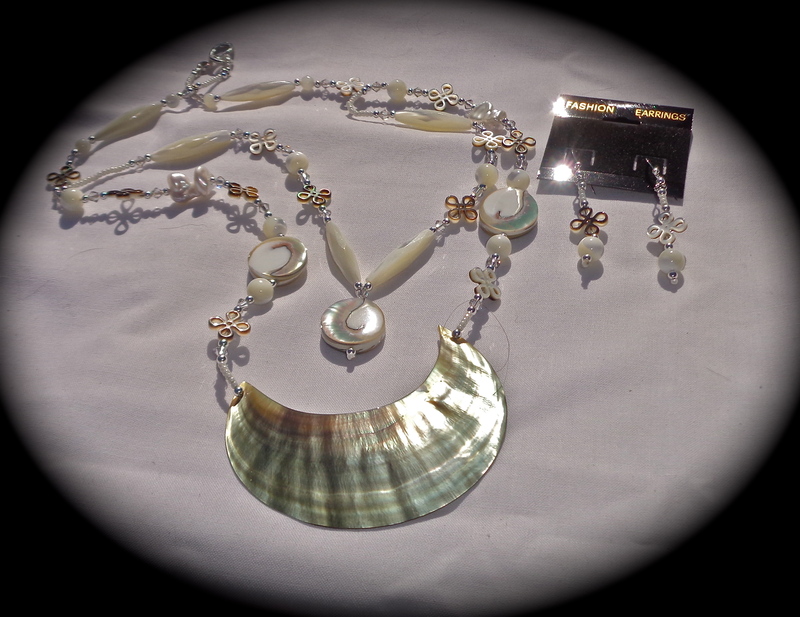 This spectacular necklace has unusually cut Paua Shells and Moonstone with delicate bows for accent. Sterling Silver beads and a lovely Bali Silver hammered hook and eye clasp complete the allure of this white-on-white masterpiece. Information-Astrophyllite has small tabular or bladed crystals which are translucent to opaque. The crystal colors which occur in matrix may be golden yellow to greenish brown and often form in star-like patterns or clusters. Location-It is found in Khibina, Russia; in Quebec, Canada; and in Colorado in the USA. Folklore- Astrophyllite is said to be a stone of self-acceptance and self-knowledge . It is said to bring calm especially for ADD, ADHD, and anxiety. Care-Being a very soft stone it should be stored separately in a jewelry bag to avoid scratching or maring its lovely surface. Do not use detergents, or chemically based cleaners. Buff with a soft cleaning cloth to renew its shine. Information- Aquamarine is a member of the Beryl Group. The colors range from pale blue to sky blue with the most prized color in the 19th century being a deep-blue aqua color. Today the most prized colors are sky blue or dark blue. History- Aquamarine is derived from the Latin words of aqua (water) and mare (sea). Ancient pendants have been carved in the image of Poseidon or Neptune the gods of the sea. Location- The best gem quality aquamarine is found in Russia, USA, and Brazil but has also been mined in South America, The Middle East and Asia, Russia and has recently been exploited in Nigeria. Folklore-Legend has it that aquamarine comes from the treasure chests of mermaids and was worn by sailors as a good luck charm, to prevent seasickness, and to protect against shipwrecks. Metaphysically, Aquamarine is said to have curative abilities, soothes, calms, and alleviate fears. Care- Aquamarine is a relatively hard gemstone therefore it is quite durable. It is sensitive to heat and should be protected from excess sun which could pale it’s color, however heating at extremely high temperatures enhances and deepens the color and clarity of the stone. The best stones of course are the ones that have the natural color of the deep blue sea. Aquamarine is brittle and sensitive to pressure. Care should be taken in cleaning. Use a soft damp cloth to buff and polish your lovely stones. “Starving” to Successful is an excellent book by J. Jason Horejs who has been a successful business owner for the past 17 years in Scottsdale, Arizona. He gives many exceptional ideas to the new or growing artistic business owner to help them make it into Galleries and to have a more productive business. The ISBN is 9780615568324. A worthwhile purchase and read. 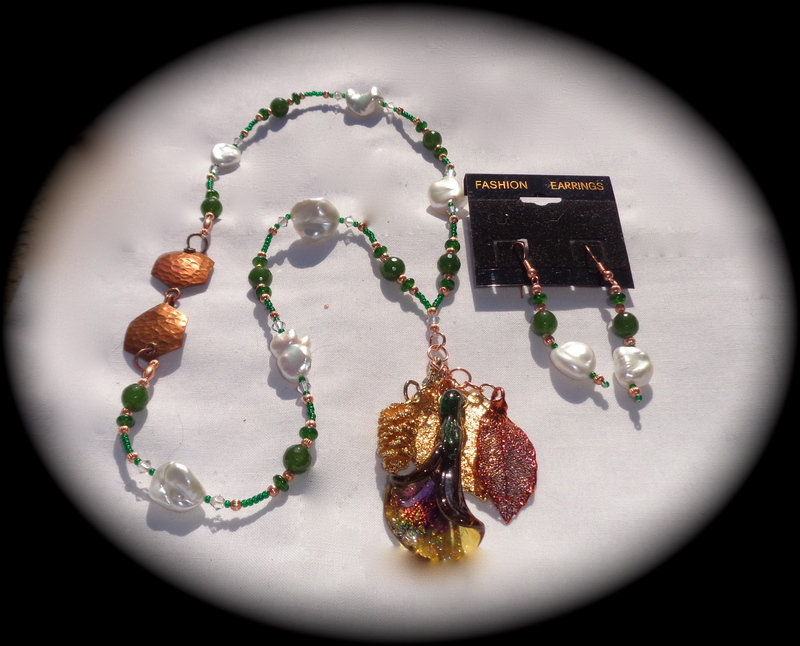 This amazing necklace is made of diopside, copper, and beautiful baroque pearls. The central is the showcase of this lovely and unusual necklace. It is comprised of a spectacular handmade glasswork flower accented by Living Gold leaves and pinecone. A spectacular piece.